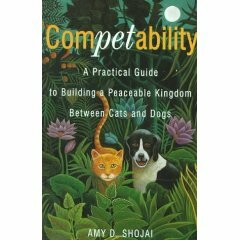 This is the subtitle of Competability by Amy Shojai. She notes that there has always been much less research about cats and even less about the relationships of cats and dogs living in the same household. She traces the integration of dogs (first) then cats into human families and how far domestication has gone in each species. Their senses affect their behavior; a fascinating chapter details how the dog’s extreme sense of smell and a cat’s powerful hearing affect how they relate to each other.